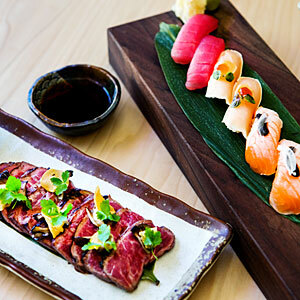 At Jackson Square’s Roka Akor the sushi’s assembled by two alumni of Morimoto Napa, and their pedigree shows in items such as the serrano-spiked hamachi roll and the subtle Mendocino uni on lime slices. And we have no complaints about what the robata grill (which burns hard, white, smokeless Japanese charcoal, along with some cherrywood and mesquite) is turning out, especially the almost buttery black cod wrapped in magnolia leaf. Finally, the dining room itself has been totally rebuilt into a glossy showroom of burnished blond wood and midcenturyish chairs, which might shake the location’s bad juju; it was previously the site of the eateries Zinnia and Scott Howard. Just to be safe, though, the owners moved the front door and changed the address. Will it work? We hope so.